Just stumbled upon Acquaintable, an app that helps you meet friends of friends without any human introductions. The app relies on the Facebook API to make recommendations based on your location (and maybe a handful of other things I couldn’t extract from first use). Datable might be a more suitable name, but I’ll digress right here. What impressed me is their user approach to user acquisition. Referrals were a huge win for DropBox who couldn’t exactly advertise on keywords because, believe it or not, there was a time when googling free cloud storage wasn’t all that common. Accruing users rapidly at low cost is pretty important for a social site whose value proposition is making introductions; if ever there was a need for critical mass, this is it. 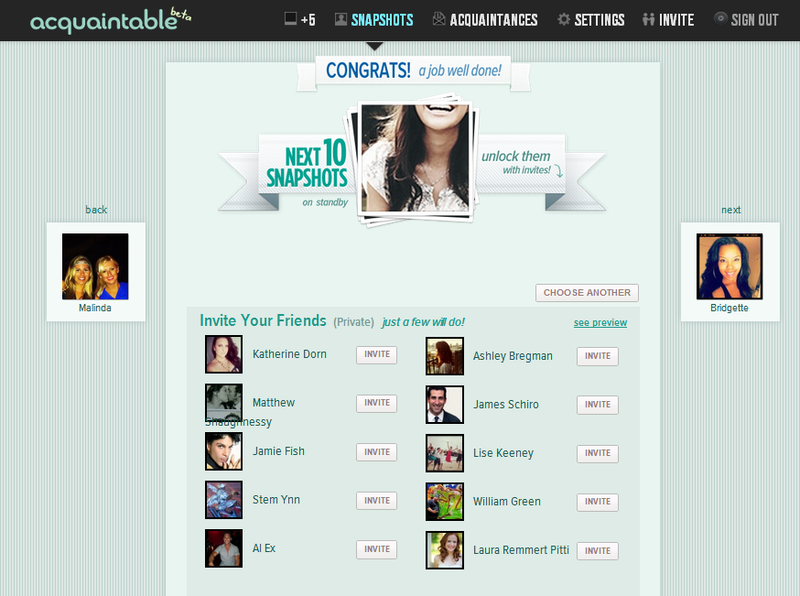 If I want 10 more snapshots, then I need to start inviting people. The invites are delivered as direct, personal Facebook messages as opposed to the dreaded event or app invite (and thus notification) that we’ve all become accustomed to ignoring. I think this strategy will yield an above average user-to-referrer rate, as well as an above average recipient-to-lead rate. A direct, personal message feels more authentic to me – not quite as a personal as a word-of-mouth recommendation, but still better than an email referral. What’s unique about Acquaintable’s referral program is that the reward for referring is provided regardless of fulfillment. In other words, you receive additional credits just for the act of referring others; redemption doesn’t increase or decrease your reward. Whether this is intentional or just a temporary limitation to be corrected in their next release, I don’t know.